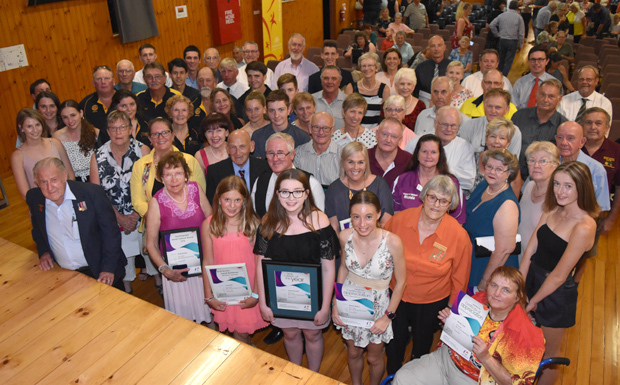 The prestigious award was announced at the official South Burnett Regional Council awards ceremony held at Blackbutt Memorial Hall on Friday night. Scott was unable to be present to receive his award – he had already volunteered to help out at another event! – so it was collected on his behalf by his father, Graham. The award was presented by the special guest speaker on the night, Justine Christerson. 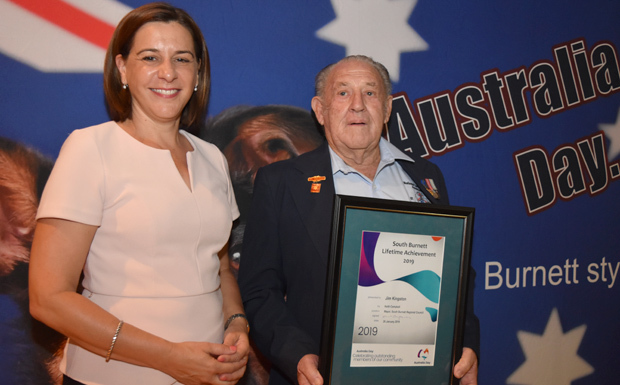 Justine is the South Burnett’s 2019 Australia Day Ambassador and a former Queensland “Local Hero” nominee. 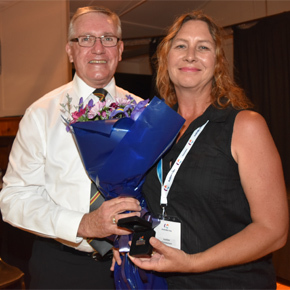 She explained the vision behind her rural patient support program, “Breaking Down The Barriers”, which assists rural patients who have to receive emergency treatment in Brisbane. Justine, who formerly lived in Biloela, recognised the need for a support program after her son was bitten by a snake. She urged the audience to never hesitate in stepping forward if they identified a need. Justine’s speech was followed by an Affirmation Ceremony and the National Anthem, sung by Sue Dowideit-Reiger. Other highlights of the evening included a Flag Entrance Ceremony by cadets from 177ACU and performances by the Blackbutt Singers of “Waltzing Matilda” and “I Am Australian”. Compere John Carey said Australia Day was an opportunity for people to come together to remind ourselves – regardless of where our personal stories began – about what unites and defines us as Australians. He said more than 50 nominations had been received for the Council awards. “Tonight we are honouring the achievements of many in our region, and in spirit, those whose names have gone before us, or who are yet to appear here,” he said. 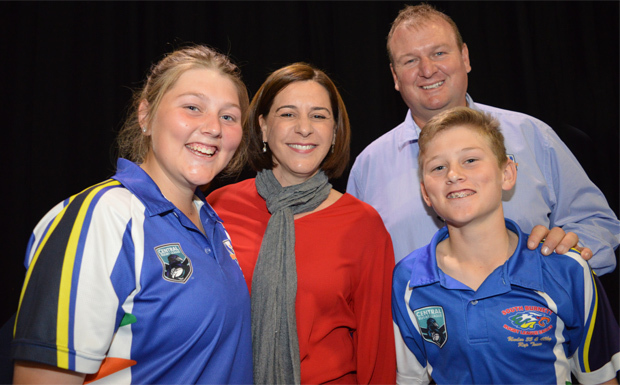 Mayor Keith Campbell thanked Opposition Leader Deb Frecklington, Agriculture Minister David Littleproud, his fellow councillors, Council CEO Mark Pitt and guest speaker Justine Christerson for presenting the awards. He also thanked Council staff for their efforts in making sure the night ran smoothly. After the awards evening closed, guests mingled and enjoyed a light supper prepared by JC Catering. Noel is possibly best known for his leadership role organising the annual Reserve Forces Day in Wondai on the first weekend in July. He has led a very small team of helpers to organise this event every year since 2005. However his contribution to the community extends far wider. He has involvement with Wooroolin Scouts, Wooroolin State School Cadets Band and Wondai Army Cadets; he’s a member of the Wondai RSL Sub-Branch, Board Director of Wondai RSL Diggers Club, official photographer for the South Burnett Race Club and the Wondai Rugby League Club, and is responsible for his well-known Main Street window displays showcasing upcoming events in Wondai. Noel is also a military historian and is recognised as an authority on searching for and documenting military graves in the South Burnett area. He has inspected every possible military-related grave in a radius of 100km from Wondai. 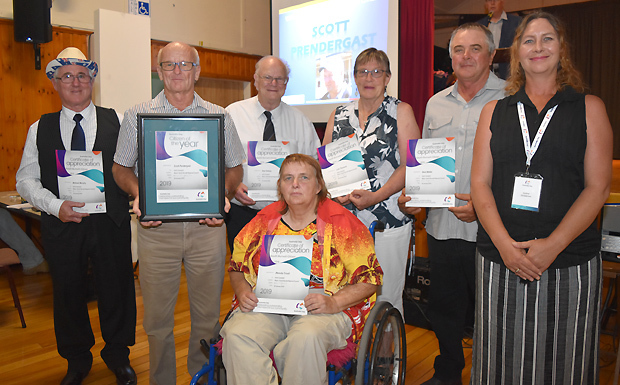 Scott has made a valuable contribution to the South Burnett community over many years. From 1999 until 2003, he was president of Murgon Barambah United Soccer Club and was instrumental in building that club to become one of Murgon’s finest sporting clubs at the time. He was an executive committee member of the Murgon Sports Association from 1999-2003 where he worked proactively to bring together the various sports clubs within Murgon to raise funds to improve the local sporting facilities for the benefit of all clubs. Scott re-joined that Association in 2016 and remains a member today. Scott has been treasurer of the Queensland Police Service Clay Target Club since 2008. He has played many roles within the Murgon Junior Rugby League Club including manager of the Under 12s and manager of the Under 14s. He as involved in organising the fundraising Gavin Cooper Dinner in 2016, and the Stanwell 9s Domestic Violence Awareness competition. He assisted with the NRL Voice against Violence team when they came to the South Burnett, delivering the program to more than 120 players and addressing students at Nanango, Kingaroy and Murgon high schools. He has been South Burnett Rugby League judiciary chairperson since 2016 and was co-ordinator for the Zone 5 Under 10/Under 35 kg carnival held in Kingaroy in July. He received the South Burnett rugby league club delegate award in 2017 and the Maximum Effort Award by the South Burnett Speedway for 2017-18. Scott was also the driving force behind the Murgon Police Charity Balls between 2001 and 2006 which raised large sums of money for Castra, Murgon Hospital Auxiliary and LifeFlight. During 2017 he received the Queensland Child Protection Week Award (leadership) for the South Burnett. He has won a Rotary Christopher Thompson Pride in Workmanship award. And he is currently OIC at Kingaroy CIB. Initially motivated to walk the streets of Kingaroy to lose weight, Michael quickly realised he could double the benefits by picking up litter along the way. He now wears a high-viz shirt and gloves for his daily ritual. His efforts have not gone unnoticed by the media and local residents who say it is not uncommon to see Michael pull over in his vehicle to retrieve litter – wherever he happens to be. Lois has been a member of the QCWA for more than 50 years, first with Elgin Vale branch and now with the Kingaroy branch. In 2015 she was awarded the QCWA Service Award for her many hours helping members. She is also a member of the Nanango and Kingaroy Show societies, currently volunteering as a steward and luncheon hall convenor; a member of the South Burnett Orchid Society, Anglican Church and local patchwork group. In all these groups, Lois has demonstrated commitment, passion and leadership. Her genuine interest and concern for community members plays out in practical ways such as visiting and encouraging the elderly, sick and lonely. Noel has always been a valued worker for the Wooroolin community and has given endless hours to help Wooroolin and the wider South Burnett. For more than 40 years he has been an integral part of the local Lions Club and has been project manager of numerous projects including the Wooroolin tennis courts, the Memerambi shade structure, Gordonbrook toilets, Tingoora bus shelter and Wooroolin playground fence. During the past 12 months, he has been involved in the construction of the thresher shed and relocation of the railway station building. He mows the land around the local tennis court, the CWA Hall, Wooroolin Hall and around the town as part of mowing his “own lawn”. He has been on the hall committee for decades and assisted with funding grants, minor repairs and cleaning and maintenance. Each year Noel ensures the hall and surrounds are at their best for the Anzac Day service. 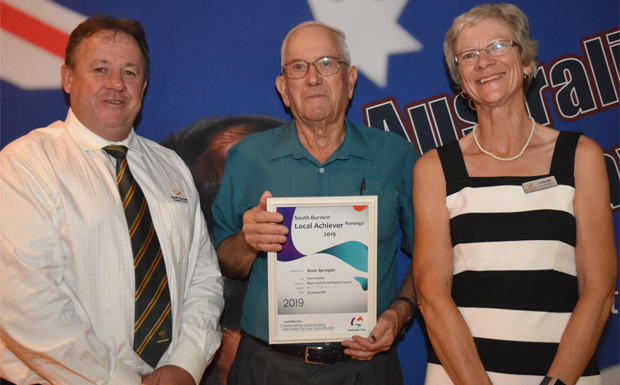 Whenever the Lions Club is asked to be behind the bar, Noel is the first to put his hand up, whether that is to help the Kingaroy Lions Trail Ride or Relay for Life dinner – or any other community function. Quietly spoken and unassuming, Noel is a dedicated worker for his community and region. Rhonda is a formidable woman – she is driven, she stands up for what is right, she expects services to be delivered in her community and she expects the same from herself. Rhonda founded South Burnett Peace of Mind in 2011 to facilitate spreading her love and care in a practical way for those most vulnerable to the impacts of mental illness and disadvantage in the region. Her own life story epitomises the power of finding strength from adversity and she has used her own experiences to help and support people living with mental health issues in the South Burnett. With a fearless approach, Rhonda holds every State and Federal Government representative she meets to account in her quest for better collaboration to deliver tangible support to the people of the South Burnett. 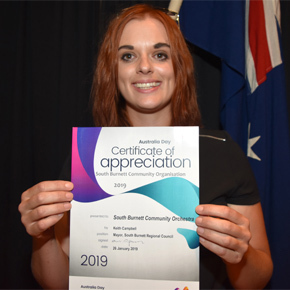 Katelyn has been an active citizen in the South Burnett community for much of young life, helping out with the running of local organisations and events. 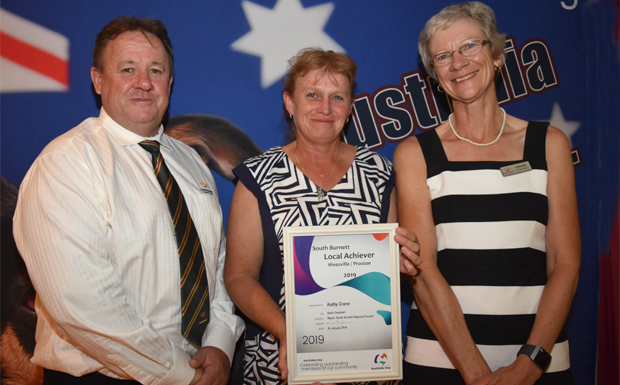 During 2018 she assisted with Danny’s Diner, BGA Cattle Field Day, storm clean up, Anzac Day parades, Lady Flo’s funeral, school centenary and the opening of the Kingaroy Performing Arts Centre; along with all the duties that go along with being a high school captain! She also has a long history of helping out with events such Relay for Life, Blackbutt Endurance Ride and coaching junior netball, and is an active member of the school instrumental band. 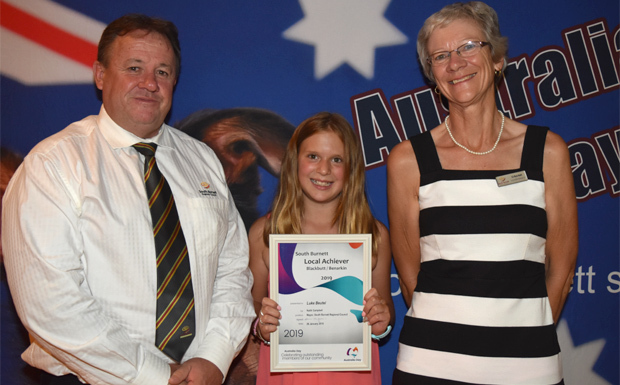 Katelyn was selected by the Kingaroy State High School, Kingaroy Rotary Club and Rotary District 9600 to represent Kingaroy at the National Youth Science Forum in Canberra for two weeks in January 2018. 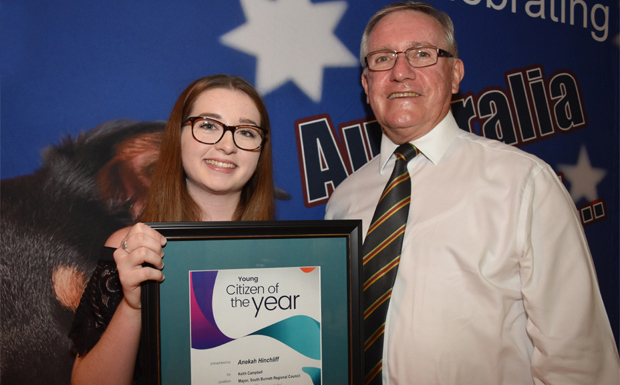 She went on to be selected as one of the 30 young Australians to attend the London International Youth Science Forum in July, and brought back invaluable knowledge and shared it with the Kingaroy State High School and Rotary communities. Katelyn always led by example throughout her school years, has been an exemplary role model and is always having a go to do her best. She has a lengthy history of achievements in sport throughout her high school years including netball, volleyball, athletics and cross country. Her leadership and ongoing involvement with the school community was acknowledged at speech night where she received a gold certificate for service to school and the Australian Defence Force 2018 Long Tan Leadership and Teamwork Award. Lize has been a student at Kingaroy State High School for the past five years and during that time volunteered numerous times at fundraising events such as the Police Ball and Dinner With The Captains. She also volunteers at Kingaroy Library during her holidays helping with children’s activities. 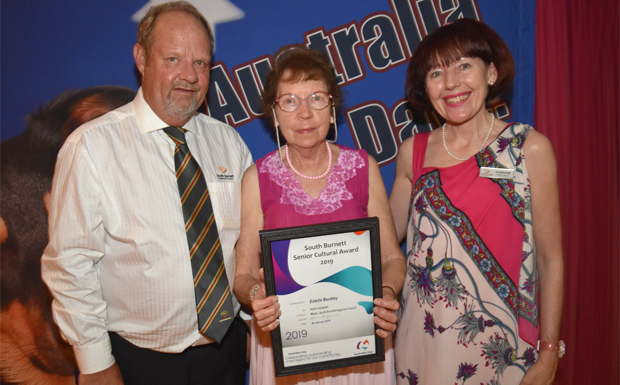 She has worked hard to raise funds for Relay For Life, was one of two band captains at Kingaroy State High School and a dedicated member of the social, welfare, media and cultural committees. Lize regularly performed in the school bands at events such as the Burrandowan Races, Wine and Food in the Park, BaconFest, Anzac Day and the KSSH Centenary and Speech night. She is active in netball and touch football. 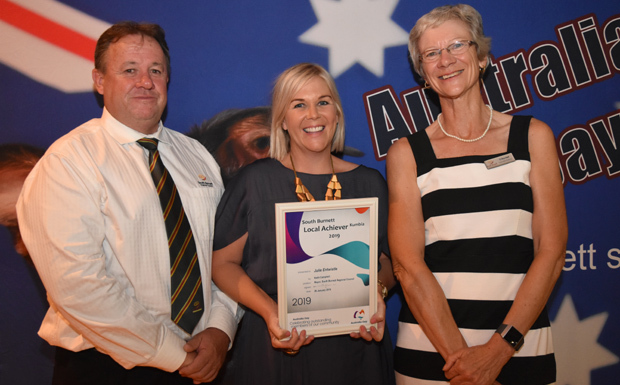 Whether it’s helping to organise the Formal, creating the school magazine, organising school socials or field trips, Lize’s goal has always been to help develop the South Burnett region further. Anekah was 2018 school captain at Nanango State High School and was nominated for the QRRRWN’s “Young Woman with A Vision” award in 2017 and 2018. 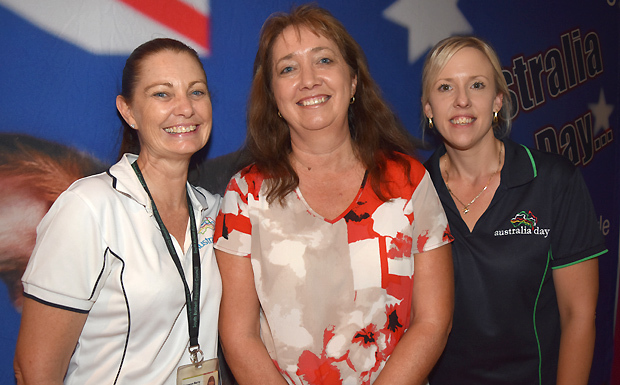 She successfully applied for a Country to Canberra workshop – one of only two applications selected in Queensland. 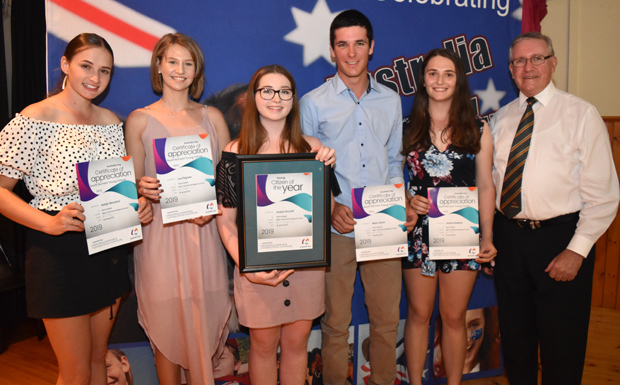 This opportunity was a unique event for the Nanango State High School students, providing them with mentoring and a leadership event that was run at a national level. Anekah was the winner of the South Burnett round of Rostrum Voice for Youth and represented the South Burnett at the regional finals. She was recently acknowledged at the school’s speech night with The ADF Long Tan Leadership and Teamwork award. She has completed the requirements of a Gold Duke of Edinburgh Award and will be able to submit this for approval in early 2019. As part of the award she has undertaken a range of volunteer roles, including a trip on the Tall Ship “South Passage” during cyclonic weather. Anekah is also a part of the Ally Walker Dance School, working tirelessly and sharing her passion for dance with younger students. She plans to study medicine this year. Blake completed Year 12 at Nanango State High School in 2018. He demonstrated his strong leadership capacity as an inspiring vice-captain for 2018 and a positive role model for younger students. Some of his academic and sporting achievements in 2018 include winning the Prix D’Honneur, the school’s prize that recognises a student who has outstanding leadership qualities; captain of the HPV, rugby league and volleyball teams; being recognised as Player of the Year for the Senior Volleyball team and received the HPV Team Spirit Award that recognised his strong contribution to the HPV team over many years. Blake successfully completed his Gold Duke of Edinburgh Award which included participating on the Tall Ships journey. He also participated in Relay for Life and the Rostrum Public Speaking competition. Jasmine was the 2018 Murgon State High School dux and 2018 school vice-captain. She was also the 2018 Student Council president and won a Rotary Excellence in STEM award. To win this, she achieved a minimum high achievement in at least three science and mathematics subjects. She also won academic awards for Maths B, English, biology, chemistry and physics. Jasmine also won the cross-country open girls title. Murgon Rotary has organised the Murgon Music Muster for the past eight years. This year’s event attracted about 250 caravans to camp at the Murgon Showgrounds for the festival. More than 1000 people attended the Adam Harvey performance during the muster. 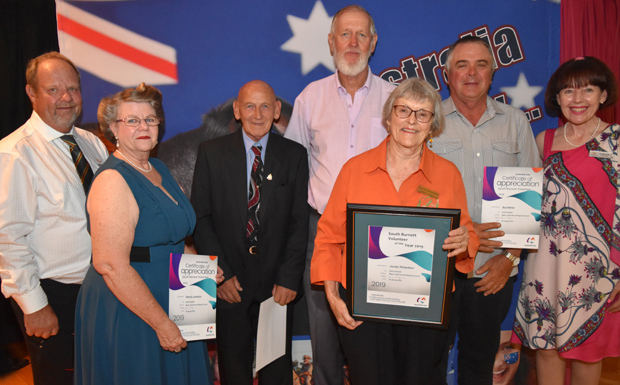 Overall, the event raised much-needed funds to support the Royal Flying Doctor Service, Southern Cross Care Castra and Blue Care South Burnett. The organisers are motivated by a vision to attract outside dollars into Murgon and the South Burnett, and each year organisers are able to track some of that expenditure through local businesses. It is estimated that more than $30,000 was spent locally with businesses, clubs, museums and musicians receiving the benefits. The Heritage Waterhole Rocks is a four-day camp out event held at the Nanango Showgrounds on the third weekend of October. This unique festival takes everyone on a trip back to the good old days – the ’50s and ’60 – providing themed live entertainment, fashion competitions, car and vintage caravan show and shine, free dance lessons and a mystery car cruise around the South Burnett. When it started it 2012, it attracted 35 caravans, increasing to 75 caravans and campers in 2013. It has grown every year to now attract more than 320 caravans. The patrons arrive as early as a week before the event providing a great economic and social boost for Nanango and the region. The committee of seven volunteers is a dedicated and enthusiastic team who continue to come up with initiatives to grow this fantastic event. 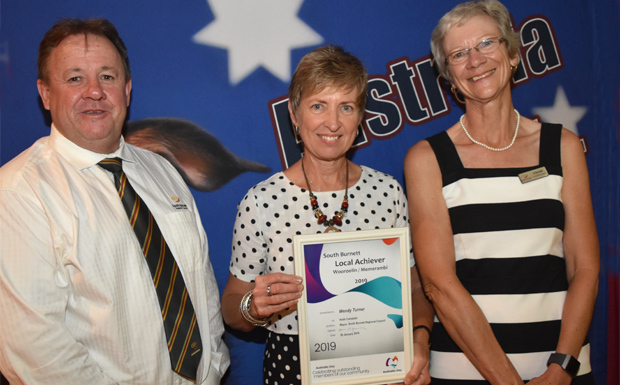 The South Burnett Show Society is not-for-profit organisation that pro-actively assists several other local community groups achieve their goals. During 2018 the Show Society made available their grounds and facilities for use by community organisations such as the Kingaroy Rotary Club for their monthly markets, and the South Burnett Flight Savers for a gala dinner and family fun day to raise money for LifeFlight. In September, they assisted “Bikers for A Farmer” raise about $6000 for the Salvation Army to assist farmers in drought and also helped with the Relay for Life cancer fundraising event. The show society actively supports the Kingaroy Speedway Club, successfully holding their speedway events, as well as making available their facilities for very little cost to groups such as the Bridge Club, the Boxing Club and the Texas Hold’em Poker Club. The SBCO has been bringing together musicians of all ages across the South Burnett since 2006, providing a place for growth and an outlet for people with musical interests and abilities. It is one of the largest community orchestras and musical groups outside the Brisbane area, and its contribution to the cultural fabric of the South Burnett is invaluable. 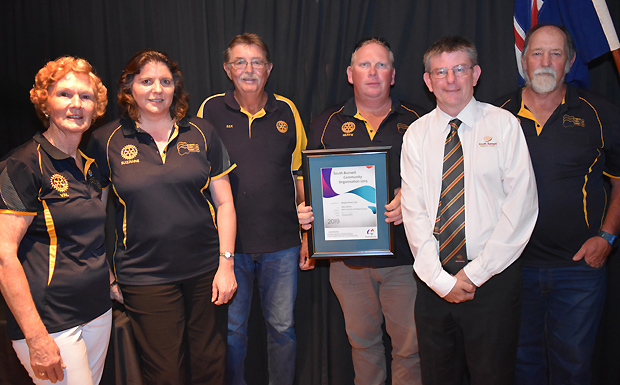 Each year the organisation and its members continue to perform their music for the communities of the South Burnett and beyond, including large and smaller group performances at various events and functions. SBCO helps raise funds for different not-for-profit organisations and causes each year, including LifeFlight, Soldier On and Legacy. 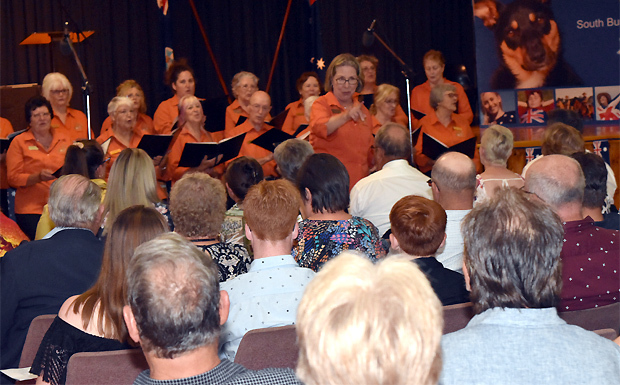 In 2018, the SBCO worked extremely hard to bring together multiple community groups such as the Kingaroy-Memerambi RSL Sub-Branch and local singers to collaborate and deliver the Centenary of Armistice project. The main event of this project, a gala dinner, occurred after the closure date of these awards and is eligible to be nominated in this category in 2020. The committee consists of members of the Blackbutt and Yarraman QCWA branch and the Blackbutt RSL Sub-Branch. 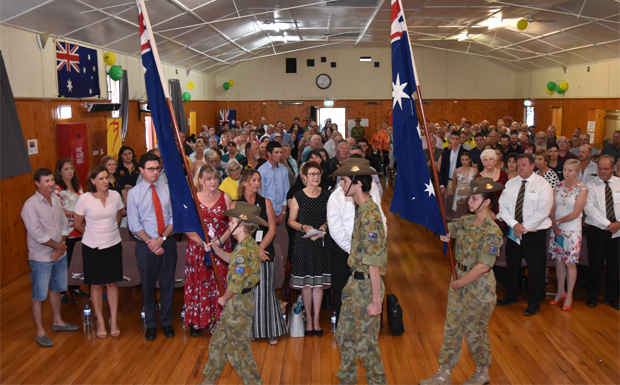 The committee worked tirelessly over the past 12 months to ensure that the Centenary of Armistice was celebrated with true patriotic fervour in Blackbutt. This group’s main event also occurred after the cut-off date for these awards, and they have been encouraged to nominate it in this category for the 2020 Australia Day awards. The markets have now been operating for more than 23 years. Starting with about 20 stallholders, the event has now grown to 340-400 stalls. The markets open at 6:00am on the first Saturday of the month, regardless of the weather, and attract thousands of people from the South Burnett, Sunshine Coast, Brisbane and beyond. As well as providing a great deal of pleasure for visitors, the markets also provide fundraising opportunities for local groups such as the Nanango Pony Club, Nanango Scouts and the Nanango State School. Murgon State High School student Janita Langton is a talented artist in her own right, designing the 2017 Queensland Reds Indigenous jerseys the team wore in the Indigenous rounds of Rugby Union played during NAIDOC Week in 2017. Her art also features in the Murgon Art Exhibition for the Murgon State High School. Janita was awarded the Murgon State High School Indigenous Leadership and Qld Association of Teachers in Independent Schools award for young indigenous leaders, given to a student with outstanding leadership in their community. This award recognised her role modelling for other students, someone who is committed to learning, along with demonstrating good leadership skills and has a good school attendance record. Summer has been a resident of Nanango for the past 10 years, an industrious young woman who is always striving to achieve her full potential. Her many cultural contributions include being a senior student of the Ally Walker Dance Academy, performing at numerous events such as Baconfest, South Burnett Family Fun Day, Kingaroy Eisteddfod and Kingaroy Christmas Carnival; participating in the Toowoomba Ballet Theatre’s production of Cinderella and successfully auditioning for the 2019 production of Rapunzel; being a member of the Nanango State High School’s instrumental program, participating in Fanfare, Kingaroy Eisteddfod, DDSW band camp; participating in the South Burnett Rostrum for the past two years, coming first in 2017 for the South Burnett, and second in the next round in Toowoomba; being a member of the junior debating team; a student council representative at Nanango State High School helping raise money for Drought Angels at the South Burnett Athletics carnival, as well as donating gifts for the Shoe Box appeal for children in need. Lucas has been captivated by music from a young age and it has always played a big part in his life. He was a member of the three Kingaroy State High School ensembles: the Symphonic Band, the Stage Band and the Brass Band. These regularly perform at a very high level at town and district events such as Anzac Day and compete every second year in Fanfare where the band achieved a gold, and the opportunity to perform in the Empire Theatre in Toowoomba. The Brass Band performed at the Kingaroy State high School Centenary of Education and the opening Of the Kingaroy Performing Arts Centre. Lucas was one of two band captains that assisted in organising the end-of-year concert, “My Favourite Things”. In between playing, he has been preparing to sit his Grade 8 and AmusA practical musical exam to add to his already achieved Grade 6 and 7 qualifications. This award is presented to a nominee over 18 years of age who is making a significant contribution to the cultural life of the South Burnett. Estelle is one of those quite achievers who for many years has helped organise the preparation and delivery of Christmas boxes sent overseas to disadvantaged children. Some of her many cultural contributions include co-ordinator of Samaritan’s Purse Operations Christmas Child; she is an RI team member at the Murgon State School and teaches religious instruction regularly at other small schools in the district. As well, Estelle has been been playing the organ for more than 20 years at Castra every Wednesday afternoon, and along with her husband Harold conducts a church service at Castra and Forestview for residents. Patricia is president of the Blackbutt-Yarraman branch of the Queensland Country Women’s Association and has been responsible for the rejuvenation of this organisation. She is also a member of the Blackbutt Art Gallery and a member of the Blackbutt RSL Sub-Branch, and a serving member of the Royal Australian Navy (retired). 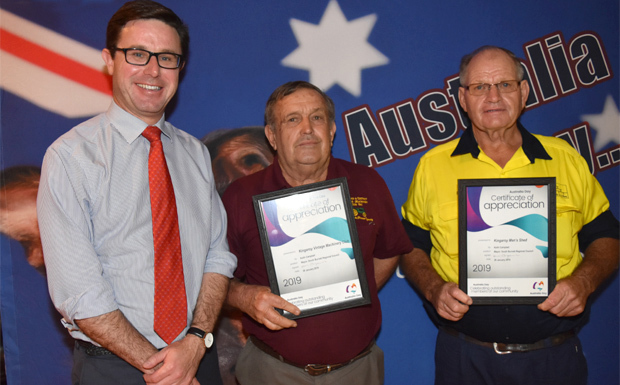 Patrick has been a tireless worker for returned servicemen and women in Queensland and it is through his efforts that saved Blackbutt RSL Sub-Branch from being closed down. 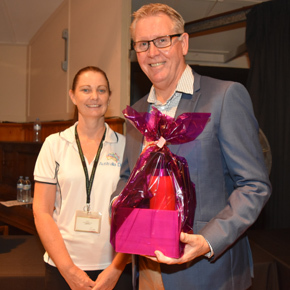 He has been the driving force that has pushed this branch forward to be a strong part of the Benarkin Blackbutt community, providing a base for other community organisations to raise funds. If it was not for his dedicated efforts, there would be no Blackbutt RSL today. Margaret is a greatly valued member and secretary for the past 12 years of the Murgon Business & Development Association. Margaret’s “eyes and ears” keeps the Murgon business community up-to-date. She is actively involved in organising the Murgon Christmas Carnival and through her expertise in organising events, attracts more than $12,000 worth of rides and activities that help celebrate the end of each year. In between sending out membership forms, organising business breakfasts, co-ordinating payments or helping Council assist local businesses with footpath permits, Margaret runs her own real estate agency business. She is a highly valued and appreciated member of her community. If you plan to walk down the street with Jocelyn, it’s recommended you allow yourself much more time than you may have originally planned! Her weekly schedule of volunteering, her many talents and her big heart for people and her community means she will always make time for people wherever she goes. On Monday she entertains with song, comedy and quizzes for the Nanango Senior Groups, where she is secretary. She is also a member of the seniors choir and regularly entertains at Canowindra. On Tuesday mornings she is off to Yarraman where the Blackbutt Singers rehearse and plan for their many community contributions. Jocelyn is the treasurer of the group. On Tuesday evening, she travels to rehearse and perform with the South Burnett Chorale in Kingaroy. On Wednesday evenings, she often heads to the Nanango Theatre where she is part of the troupe and the treasurer. If it is the second Wednesday of the month she can be found at the Probus Club where she is currently the secretary (and previously the president). 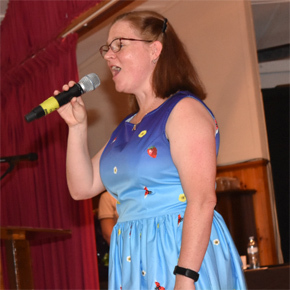 On Thursdays and Fridays she will be in Kingaroy at the South Burnett Musical Comedy Society, and then the South Burnett Tutoring Association, where she is also the secretary. On Saturdays, you will find her volunteering at the Nanango Visitor Information Centre. Nelson has been an active member of the SES for the past 30 years and is also an active member of the local rural fire service. His service to community also includes being a JP for more than 57 years, and he is also a lifetime member of the local pipe band. Nelson also regularly visits residents at Orana. 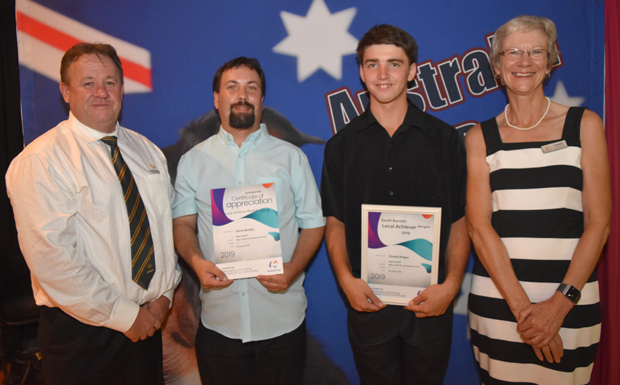 Lachlan is a 15-year-old Kingaroy High State High School student who has involved himself in many school and sporting club activities and commitments. The sport he is most passionate about is football (soccer), where he has enjoyed the challenges of selection at a higher level. To continue this development he is hopeful of being selected in a National Premier League competition team due to be announced shortly. His football pursuits during 2018 have seen him selected as vice-captain and goalkeeper in the U16 Wide Bay School team; selected in the U15 South West Zone team based in Toowoomba, with an opportunity to play the captain role in the team that travelled to Mackay; touring with the Southern Downs Academy to Spain; refereeing junior and senior games in local club competitions, and assistant refereeing for senior games in the Toowoomba Football League, including some games in the National Premier League. For the third year in a row, Lachlan was awarded Junior Referee of the Year and he was also a finalist in the Bass Blue Award for sporting achievements. He also played softball at the State carnival. 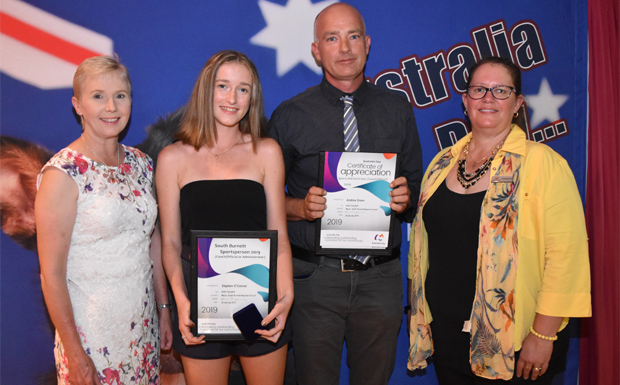 During 2018, Murgon State High School student Amy won the 13 Year girls cross-country championship, the 13 Year girls athletic championships, swimming age champion and the aggregate award. She created history at the school by winning the School’s Sportswoman of the Year Award, achieving this outstanding achievement over all the senior girls. Amy is incredibly talented for her age and has a big future ahead of her. Blackbutt resident Matthew Rankin has represented his school, town and region at the highest level. 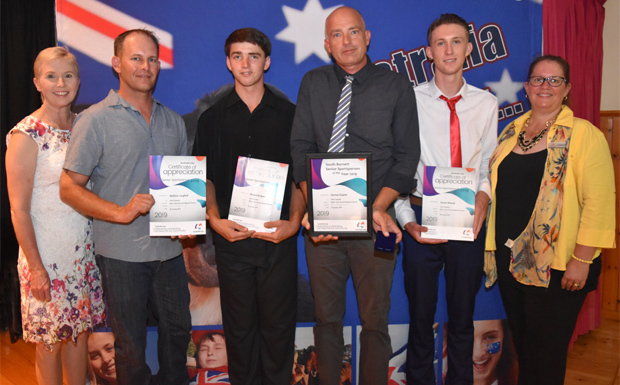 Nanango State High School proudly proclaimed that Matthew was one of the most successful athletes the school had ever produced after he was named national champion in cross-country. He has continually broken records at school, district and regional events that have been held for many years. During 2018 he was named in his second Queensland Athletics team, another huge achievement. Matthew has overcome significant barriers, including completing all his training without a coach or training squad. At the national championships he was up against students who have coaches, trainers and support crews. Matthew turned up as an individual representing his school, town and family … and won the race! Summer makes weekly trips to Brisbane to train in her sport, race walking. In 2018, she has achieved a variety of goals at State and National championships, and was part of the team that won the bronze medal in the National Teams Race. Summer’s dedication and hard work led to her qualifying at the Wide Bay level for the recent Queensland Schools State Track and Field championships. She competed in the 13 year girls 1500m, setting a new personal best time, and in the 3000m was third in Queensland. This means she will participate in the Australian championships in Sydney in April 2019. Summer also competes in triathlon, cross-country and middle distance running and has a passion for dance and swimming. Ryan has had significant sporting success in football and futsal during 2018. He was selected in the Queensland Country Futsal team that competed in the Australian National Futsal championships in Sydney in January 2018. He was a selected in the Wide Bay Pirates Futsal team that competed in Brisbane in April 2018, and in the Queensland AFA Futsal championships. The team participated in the finals of the 2018 event which was an amazing achievement. Ryan also plays for the Kingaroy Junior Football Club and has been successful this year being selected in the South West Queensland Under 13s Zone representative team which competed at the Football Queensland Community Cup in Mackay in July. Ryan, at 13, was also selected in the Under 16s South Burnett School Football team which participated in the Wide Bay trials in Bundaberg. He was also recognised as the U13 boy 2018 Age Champion at Saint Mary’s Catholic College. He went on to compete at the South Burnett secondary athletics day where he was placed in javelin, 400m, discus, shotput and high jump. Ryan is also a volunteer for the South Burnett junior and senior soccer clubs, regularly giving up his time to referee and help. He is also involved in the South Burnett Stingers development program and gives this time readily to help train and mentor younger players. Matthew was born and raised in Queensland’s inland fishing capital, St George, and grew up chasing Murray Cod, Yellowbelly and Silver Perch. He was always destined for fishing greatness. His childhood dream came true when he was named “Australia’s Bass 2018 Angler of the Year” at Boondooma Dam. This required competing against the best Bass anglers in six rounds throughout Australia. His many successes follow his decision five years ago to chase his dream full-time. He has won national awards and is looking forward to the trip he won to the US this year to compete against anglers from all around the world. Matt also provides comprehensive fishing reports about the South Burnett’s dams including photos for local media, including southburnett.com.au. Richard, 18, has competed every year during his time at Murgon State High School in cross-country and track and field teams. Competing as a para athlete due to a disability, he has made everyone around him proud by making it to different town, city and interstate competitions. Some of his 2018 achievements include representing Wide Bay in Brisbane for State trials, receiving gold in 400m and silver in 200m, 800m, 1000m and 1500m. He came fourth in his relay and qualified to compete in Sydney in 2019. Richard represented the State team for cross-country, coming 2nd in the time trial at this level. He was age champion at Wide Bay 16 to 19 year-old cross-country and track and field, and won a gold medal in the 800m State trials on the Sunshine Coast. 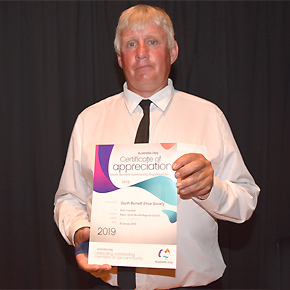 Richard also regularly receives high school, South Burnett and Wide Bay awards including vocational merit awards and full colours for athletics and cross country. 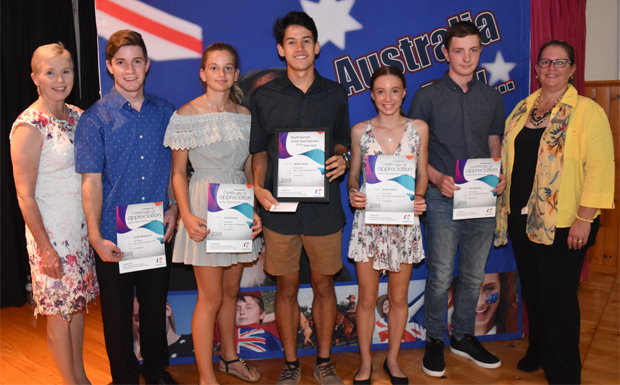 Richard won the 2018 Murgon State High School Sportsman of the Year award and the Pierre De Coubertin Award, presented in recognition of his sporting achievements. Steven has had a busy 2018 participating in swimming, cross-country, athletics and soccer at both school and club levels. He excelled in cross-country and athletics and was placed second at school cross-country, first at the South Burnett trials (including being named age champion), achieved fourth at Wide Bay and was placed in the top 30 at the State trials. His highlight achievement was breaking the 18 years 400 and 800m records and being named age champion. He further represented the South Burnett with distinction by breaking the 18-year-old 100m, 200m and 400m records at the zone championships in Bundaberg and was awarded age champion at that event. He was age champion at the Wide Bay trials and went on to represent Wide Bay at the State trials in Brisbane where he came third in the 200m, and was a semi-finalist in the 100m, a finalist in the 400m and came fifth in the triple jump. Steven also loves soccer and plays for Kingaroy Wests and South Burnett United. He referees at the primary school carnivals and has represented the South Burnett and Wide Bay in soccer. An early introduction to thoroughbreds through her hobby-trainer parents, Frank and Gabrille, set Hannah on a path to riding success. Hannah’s well-developed saddle skills acquired at pony club, dressage and eventing plus a four-year stint as a trackwork rider and strapper meant Wondai-born Hannah’s transition to apprentice jockey was destined to happen. Recently, she has been travelling to ride in races from Rockhampton to the Gold Coast, and all points in between. Hannah’s determination, sacrifice and tenacity are paying dividends wherever she rides. 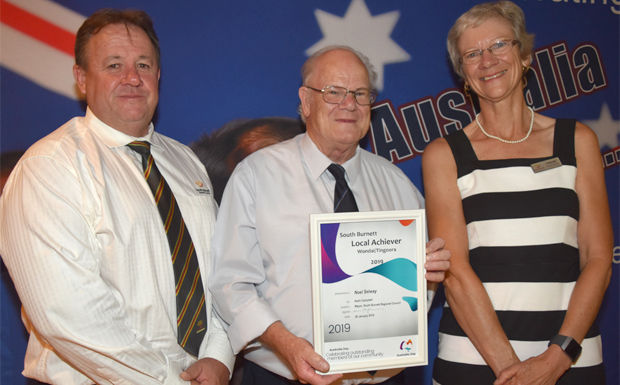 Stephen began his voluntary coaching of South Burnett athletics in 2010, and by 2011 enjoyed it so much that he took his first steps towards becoming an accredited running coach. While training his own family, he re-discovered his own running legs and became an active athlete again. Stephen offers running lessons for South Burnett athletes during the season and off-season. He is now a Level 2 advanced middle distance coach with Athletics Australia. In 2014, two of his athletes won medals at the State Little Athletics Championships, the first in 30 years for the club. At then end of the 2016-17 season, Stephen moved back to his home town of Nanango to help start Nanango Little Athletics. Andrew drew on a long family history and work experience in racing when he took over the reins as president of the Nanango Race Club. He returned to Nanango after a three-year stint in Sydney and Melbourne working for the John Hawkes stable and quickly put his experience and passion for racing to good use! Andrew uses the time creatively that he spends mowing the tracks and surrounds, travelling to country race meetings, supervising general maintenance, meeting with committees and conducting barrier trials to come up with new ideas to grow the race club. For example, Nanango Race Club has leveraged off local events such as the Goomeri Pumpkin Festival by sending a free bus for earlycomers to the festival so they can attend a race meeting. The outcome: lots of new faces at the track. Even the Fashions of the Fields have undergone an overhaul where nominees can now participate by taking a selfie of themselves (or their group) at the races and uploading it before 3:00pm for a chance to win a prize. Andrew is a key driver behind the vision to prove that Nanango’s Lee Park is one of the best race tracks in country Queensland. 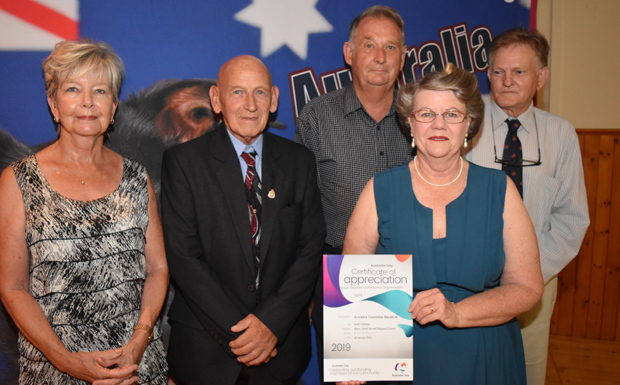 This award is presented to a resident over 60 years of age in recognition of their outstanding achievement and who displays ongoing excellence in their field and in the community, demonstrating leadership and innovation whilst contributing towards the South Burnett region. Born into the generation known as the “silent generation”, Jim Kingston has made excellent use of the 735,984 hours of his life so far to make the South Burnett a richer place. He was born in Kingaroy on January 30, 1935, and has lived in Murgon for the past 60 years. Jim has served in various roles including president of the Murgon RSL, Murgon Apex and Murgon Rugby League clubs; founding member of the Murgon Bowls Club and spent some time as a produce steward for Murgon Show Society. He served for many years conducting the annual Spastic Appeal and co-ordinated other memorable fundraisers for Radio 4SB’s “Ugly Man” competition, the monthly dances at Redgate and Cloyna and two fracture beds for Murgon Hospital. During the 1970s and 1980s, Jim was president of the Tiernan’s Social Cricket Club and game co-ordinator, and in 1957 helped raise funds for the construction of the Buffalo residential complex. In 2014, he was part of a South Burnett delegation that travelled to the Netherlands at the invitation of the Mayor of Dodewaard, where Jim represented Murgon as the President of the Murgon RSL Sub-Branch. 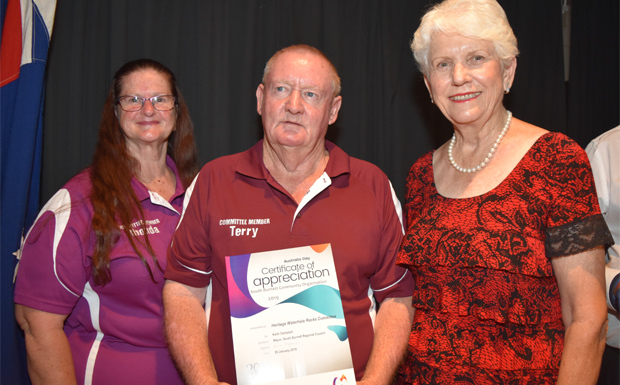 He was awarded the 2018 Murgon Business and Development Association award for an outstanding contribution to Murgon by a citizen or group. Jim also has a well-deserved Order of Australia medal, National Service Medal and Australian Defence Medal. His musical talents have led him to be part of a quartet that sings and entertains residents and others in local aged care facilities. At just 14 years of age, Luke already has some great achievements under his belt. He has competed and represented his school, St Mary’s Catholic College, in Kingaroy at the South Burnett cross-country, athletics and soccer. He won age champion in swimming, athletics and cross-country. He is currently playing football with the South West Queensland Thunder based in Toowoomba. He was selected in the Queensland Country U13 boy’s soccer team that competed at the FFA National Youth Championships at Coffs Harbour in September. 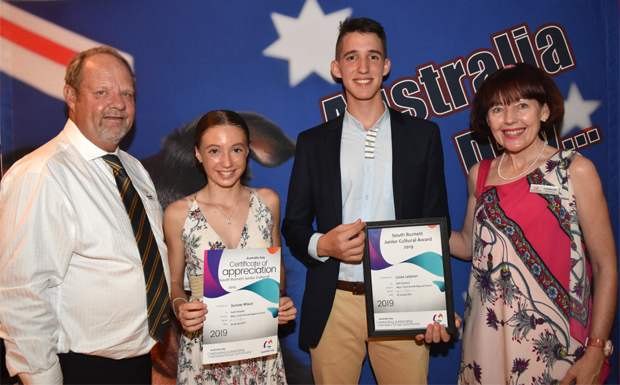 Recognised locally as an extremely polite, well-mannered young man who displays excellent sportsmanship and leadership both on and off the playing field, and is a worthy recipient of the Blackbutt Benarkin Local Achievers Award. Keith is another standout member of the silent generation. 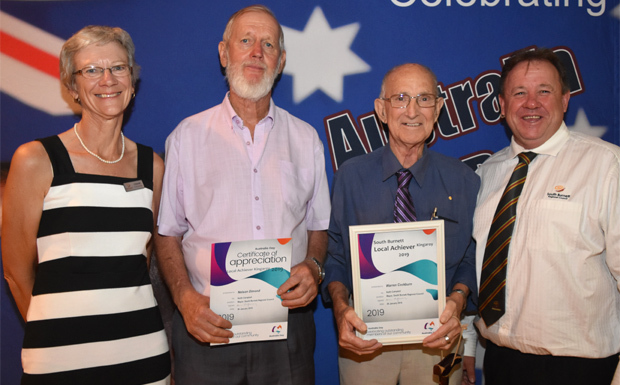 The long-term Nanango resident has volunteered his passion for community through the Nanango Anglican Church, Nanango Golf Club, Nanango Town & District Band, Nanango Meals on Wheels, Nanango Country Music Combinations, Nanango Indoor Bowls Club and Nanango Senior Citizens. He currently serves as secretary of the Nanango Country Music Combinations and Nanango Indoor Bowls Club. Jules came to Kumbia a little more than five years ago. Her aim to maintain a low profile was derailed as locals quickly discovered her many talents, courage for speaking out on issues important to her and putting her pen where heart is. She soon began writing successful grant applications to improve the lives of those in her community. Jules volunteered for several organisations, including the Kumbia Catholic Community, secretary for the Kumbia Kindergarten, Kumbia Debutante Deb Ball committees, Kumbia State School P & C and helped out with many fundraisers including the Kumbia Brain Drain and catering for the Tractor Rally and the Kumbia Melbourne Cup. Jules’s independent, resourceful and self-sufficient capabilities have been highly valued by the Kumbia community. Her successes included successful grant applications that brought improvements to the Kumbia Cricket Club, the Memorial Hall and tennis courts. Warren Cockburn currently devotes about six hours each day, six days a week in a voluntary capacity for a wide range of community organisations in the Kingaroy area, despite some very challenging health circumstances. He has been a member of the Kingaroy-Memerambi RSL Sub-Branch for many years where he still retains two key executive positions as secretary and deputy president. Each day typically finds Warren using his advocacy skills to support veterans dealing with their challenges, completing and lodging their paperwork, organising and recording minutes of meetings and providing support for Legacy, Kingaroy Legatees and the Community Health Consultative Committee based out of Kingaroy Hospital. Warren is also a board member of the Kingaroy & District RSL and Citizens Memorial Club, a 9200-member club where his expertise and contribution is greatly valued. He is a former National Servicemen and has maintained an active involvement in the National Servicemen’s Association of Australia, where he has been the long-term president of the South Burnett branch and vice-president of the Queensland branch. Wendy Turner has lived in Wooroolin for the past 30 years, recently strengthening her commitment to the town by purchasing the local Post Office agency. Thanks to Wendy’s sharp eye for photography and a love of history, Wooroolin’s place, and other locations as well in the South Burnett are well documented. Serving as the hall committee secretary for over 10 years, writing successful grant applications, managing hall books and ensuring the Hall is available to community are just some of the many ways Wendy gives back. Kathy is a big fan of getting people and her Proston community moving. An incredibly community minded-person, Kathy has pioneered movie nights, tai chi for arthritis classes and has demonstrated the benefits of Tai Chi at community events. She drove the clean-up and development of Reinke Scrub as a major tourist attraction for Proston and was behind progressing the development of the Heritage Walking Trail around Proston township. Both of those projects focus on helping people get moving and reaping the associated health benefits. After two very successful “Focus on You” events, her community is now more informed about diabetes and other health priorities. Kathy’s talents extend to grant writing and she has successfully applied for grants to establish a community labyrinth in the form of a series of paths in a park to assist with stress and mental health. Kathy is also an active member of the Proston Round Table, a community organisation which meets monthly to help Proston progress. 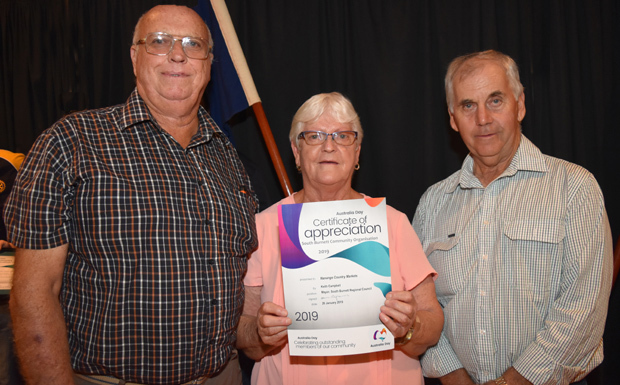 Darren has been the Murgon Neighbourhood Watch Area co-ordinator for many years, an organisation that reached its 20th anniversary milestone during 2018. He lives and breathes for his Murgon community and proudly helped to organise and chair the NHW’s 20th birthday celebration. His volunteer role has led him to work closely with the community and Murgon Police to help improve the safety of the community. 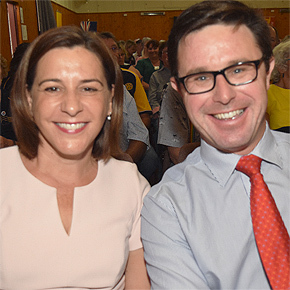 As well as serving as chair of the local committee, Darren has served on the State Government’s Neighbourhood Watch Community Advisory Committee for South West Queensland. The Murgon Business & Development Association has acknowledges his support and proudly nominated him for this category. Kingaroy & District Machinery Club which made their facilities near Kingaroy Airport available as the base camp. Thank you so much for having myself and Helene last night. Congratulations to each nominee on your achievements and well done for inspiring others to do better, be better and for supporting your community, so many amazing people were in just one room last night, bursting at the seams with long lists of achievements! Well done South Burnett what a brilliant Australia Day weekend! Once again thank you for welcoming us to your region.